Isabel Hees was a college student living in Sevilla, Spain, when she had an epiphany. She lived in the Andalusian city for 11 months while participating in a study abroad program with the University of New Mexico. She spent her days dancing Flamenco and making prints in art classes, and that's when it hit her: "This idea came," she says, "of, OK, how do I combine these two things?" Beyond loving both forms of art, Isabel saw a relationship between printmaking and the dance. "The connection came when I was in my printmaking class, carving into a piece of wood and doing relief woodcut prints. And then my class right after would be me pounding my feet into a wooden surface, so that connection with wood and material really drew me in." Isabel started dancing during her freshman year at UNM, which has a renowned Flamenco program. "It happened in this really odd way," she says. "You know, you're a dweeby little freshman and you're trying to get into this amazing African dance class you've heard so much about … but you're low on the list. So by the time you get there and you're registering for classes, African dance is full, yoga is full, but Flamenco 1 was open in a timeslot that was perfect for me." And it was love at first dance. "I just loved it. There wasn't a day I didn’t go in by myself and practice my turns, or my footwork. I was captivated by its bravery, its boldness. I was smitten with the ferocity." Isabel says she even fell for the accoutrements that came along with Flamenco, like the shoes. After a decade of thousands of hours of rehearsals and performances, Isabel felt pulled back to that symbiotic project she'd dreamed about in Sevilla. "I was on the professional track and halfway through my apprenticeship," she says. "I thought, 'I need to make room for this other project. It's something that needs to be done. I can't just think about it and dream about it, and one day wish I had done it." When I meet with Isabel in a sunny coffee shop on a frigid January morning, she's been working on the project on and off for five years. 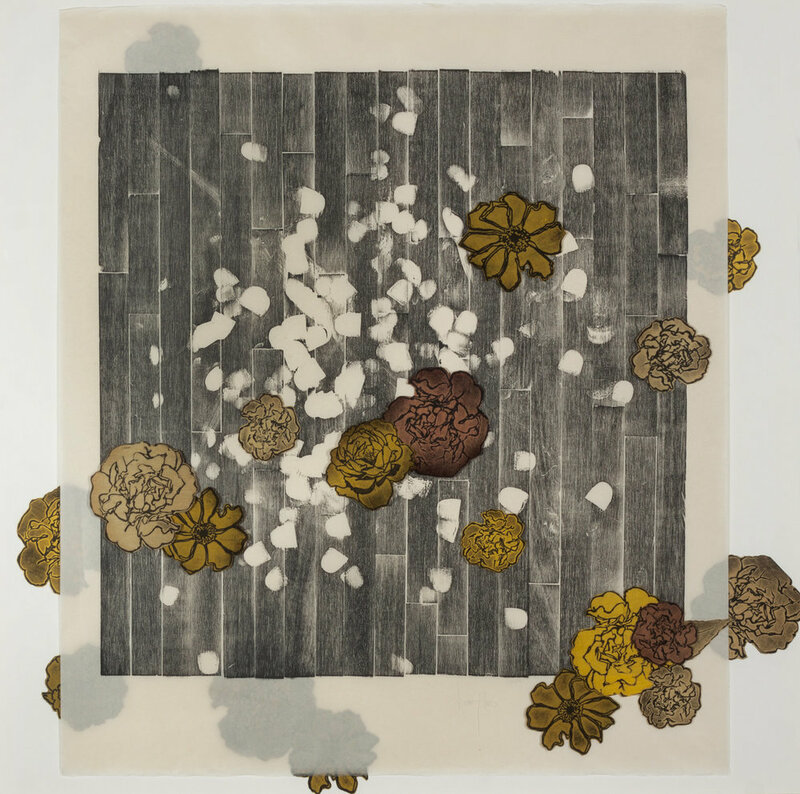 Her ideas have been actualized in her series of relief prints titled Huellas: Impressions Though Movement (huellas translates to footprints), and the series debuted in June 2017 at Isabel's home during an opening shindig for the Festival Flamenco Internacional in Albuquerque, New Mexico. She also exhibited pieces from the series at the bright, modern coffee shop Zendo in the downtown area in January this year. 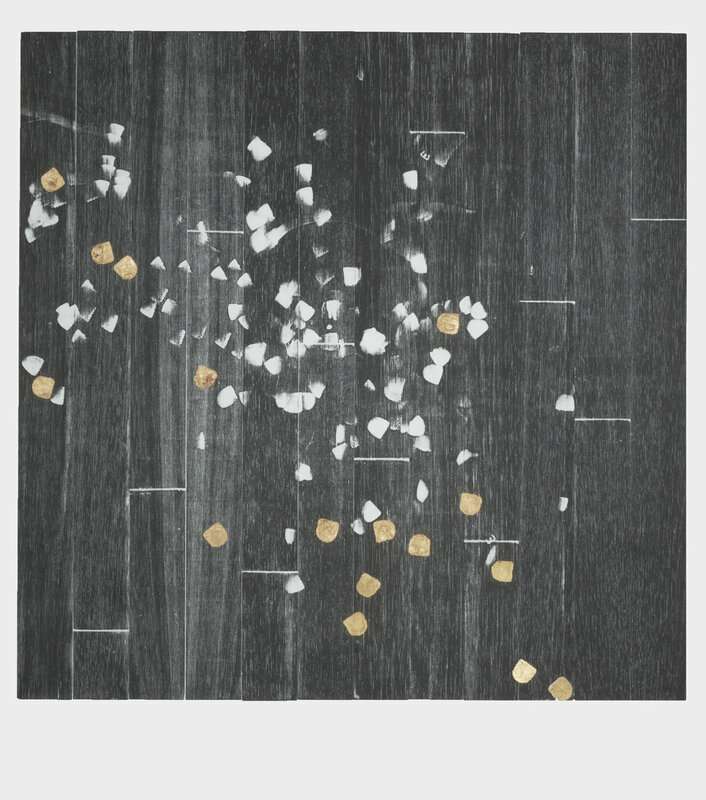 The prints in Isabel's series are made from small balsa wood dance floors, which she builds herself. She collaborates with Flamenco artists, who dance on the soft wood, leaving impressions of their footwork behind. "Clavos" are small nail heads in the soles of Flamenco shoes that help create a strong percussive sound, and they add depth and dimension to the impressions their footprints create on the balsa wood. Isabel covers the marked wood in ink and runs it through a press, creating a visual representation of Flamenco movements. The ink sits in the spaces untouched by the dancer, so the steps appear as negative space. She can pull around eight prints from each dance floor before the press squashes the steps back into the wood. "I've been printing on silks recently because I love the idea of movement and their costumes are beautiful and super elaborate, so I am trying to bring in these elements that are fundamental to Flamenco and Flamenco aesthetic." The choreography featured in each work is left up to the dancer, and Isabel stresses that creating these prints is a partnership. In her artist statement she writes, "Huellas has allowed me to relinquish control of what appears on my canvas. It's as if I have a paintbrush with a mind of its own, one that guides my hand, making strokes that I am there simply to support. Collaborating with other artists is integral to this project. The efforts of the community are far more intriguing to me than the goings-on of one singular brain, one singular source of inspiration or creativity. 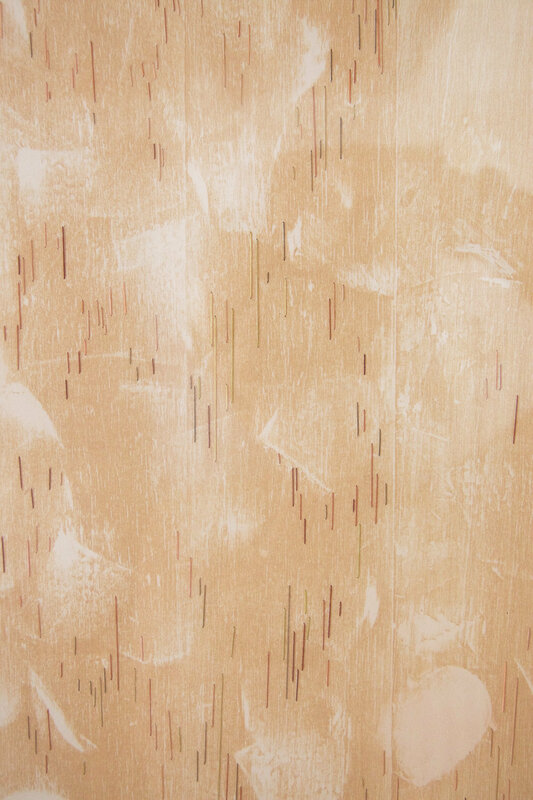 Yes, I create the faux floor balsa wood matrices, but I do not make the image. I just print what's there — what is gifted to me. And there is a sense of liberation in this." As well as having a different pattern to the footwork, each piece is made unique by Isabel's craft. She knows many of the performers through her Flamenco program and adds handmade details — such as pressed flowers, sewn textiles, and gold leaf — to tie the works closer to the dancers' personalities, styles, or modes of movement. While Isabel diligently practiced her plantas and golpes (types of steps made with different parts of the foot) throughout college, her major remained fine arts. "I've always been more naturally inclined toward image-making and producing. So it was a trip to go on a 10-year tangent in the performance arts," she says. "After 10 years I made the decision to go back to something I feel I can express myself in more fluidly." When you meet someone for the first time and they ask what you do, there's usually a short reply: "I'm a scientist," or, "I work at Bloomingdale's." But that's not really representative of who you are. Our world may require focus and narrow dedication — especially when it comes to vocation — but that's counter to the multitude of talents and interests each of us maintains. Truly, every person is a universe. Innumerable experiences, connections, and ideas are contained in just one human being. A surgeon may play piano in her spare time; some pilots are poets at heart. But we tend to stay with one focus, and leave parts of ourselves to spare time, or hobby, or the weekend. Isabel is an exception, because she's taken her seemingly unrelated passions — Flamenco dancing and printmaking — and made them one in her artwork. Huellas: Impressions Through Movement will be on display March 9 through April 12 at the Tractor Brewing Company Wells Park location in Albuquerque, NM, as well as sometime in 2019 at the Center for Contemporary Arts in Santa Fe, NM. Hees plans to continue the series, and stresses her fulfillment in the process of collusive creation. "What's really special about it for me is the collaboration," she says. "I wouldn't be interested if I wasn't working with other artists, and especially artists that blow my mind. I love the idea of capturing the seemingly invisible movement that is human expression. This is a project that I aim to continue with other forms of movement." As for being an artist in 2018, and what that means to Isabel, she says, "I think it's good any time we make these human connections; that's really important. The process of creating is good energy. So it feels good to be able to do it. And if I can share that with a few people who are also enjoying it ... It's keeping my spirit up, and that has a ripple effect." About the author: Maria was born and raised in Santa Fe, New Mexico, where she currently lives, working as a freelance journalist. She wrote several 2017 cover stories in the Santa Fe Reporter, and formerly had a column called Bed Head, which focused on New Mexico-based fashion. She also makes clothing and sells curated vintage through her online shop, Heirmana. Over the past year, Maria has become more and more dedicated to telling women's stories, as she feels it is the best work she can do during this time of change, awakening, and female empowerment. She highlights women who are inspiring movements, breeding positivity, and spreading supportive messages to other women through their art, music, food, design, writing, and more.